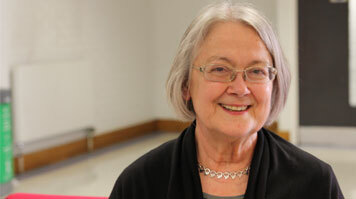 A report into social mobility within the legal aid profession was launched at LSBU with a keynote by Supreme Court deputy president Baroness Hale. The report 'Social mobility and diversity in the legal aid sector: One step forward, two steps back' was authored by Young Legal Aid Lawyers—a group of students, paralegals, trainee solicitors, pupil barristers and qualified junior lawyers. The event was supported by a number of law firms and London South Bank University's department of law. Katie Brown, co-chair of Young Legal Aid Lawyers, introduced the report and welcomed Baroness Hale who became Deputy President of the Supreme Court in June. The first woman Justice of the Supreme Court in 2009, Baroness Hale has been named the fourth most powerful woman in the UK by BBC Radio 4's Woman's Hour. Her keynote focussed on two themes: social mobility in legal education and access to justice. On social mobility, she noted that 31 per cent of solicitors in England and Wales went to independent schools—and for a long time, she was the only Supreme Court Justice who had not attended a fee-paying school. On access, Baroness Hale spoke of the "steady and now precipitous" decline in the legal aid system. More than £350m was cut from the legal aid budget in April with legal help no longer available for most benefits, debt, housing, employment, family and immigration cases. "The role of the state is not only to provide a system of courts, laws and justice, but to provide access to it. "In family law cases, there is almost always a weaker, poorer party and a richer, stronger party. Denying the weaker party a level playing field is a denial of justice. "I salute the courage and determination of Young Legal Aid Lawyers." Baroness Hale spoke highly of universities providing pro bono legal advice to the general public which she thought was becoming increasingly professionalised. At a time when legal aid is being radically restricted, LSBU's Legal Advice Clinic is such a resource, offering immediate, face-to-face advice at regular drop-in sessions. Trained law students—working under the close supervision of practising solicitors—provide information and generalist advice on almost any legal topic. Andy Unger, head of the law department in the Faculty of Arts and Human Sciences, explained that this provides LSBU's law students the opportunity to gain invaluable legal experience and improve their employability as a core part of their course. The report launch also featured a panel discussion with BBC investigative journalist Raphael Rowe (compère); David Johnston, CEO of the Social Mobility Foundation; Simao Paxi-Cato, junior barrister for Invictus Chambers; Lucy Scott-Moncrieff, director of Scott-Moncrieff & Associates; Chris Topping, partner of Broudie Jackson Canter Solicitors; and James Wakefield, director of the Council of the Inns Court.